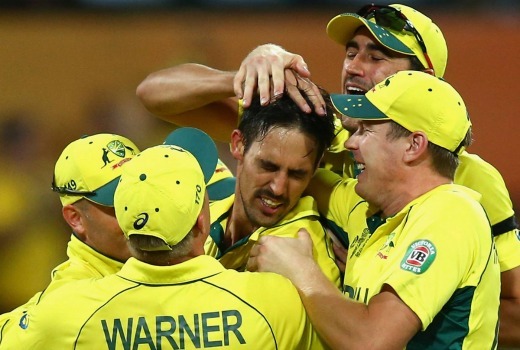 Australia’s success in the ICC Cricket World Cup has given Nine the biggest share of any network all year. Nine network won Thursday with whopping 43.2% share then Seven 24.9%, TEN 14.3%, ABC 12.6% and SBS 5.1%. Nine now sits at just 0.3% behind Seven for the week, its most competitive performance so far this year. 1.61m / 790,000 was also the biggest single audience Nine has enjoyed all year. The figures were higher still adding in regional viewers. Following the cricket for Nine were Nine News (1.19m in 4 cities / 1.06m in 3 cities) and The Footy Show (910,000). Hot Seat was only shown in 2 cities at 267,000. Seven News (1.08m / 944,000) was best for Seven then Home and Away (674,000), Million Dollar Minute (602,000) and Movie: Pretty Woman (486,000). The Amazing Race was 109,000. The Project (523,000 / 403,000) led a tough night for TEN. TEN Eyewitness News was 428,000, Modern Family was 406,000 / 403,000, Gogglebox was 381,000 and SVU was 227,000. ABC also had a tough time of it with ABC News (698,000) its strongest performer. Next were 7:30 (542,000), Outback ER (507,000), the final Hiding (320,000), Antiques Roadshow (288,000) and How We Got to Now (229,000). The final Gourmet Farmer Afloat was 251,000 for SBS then World’s Greatest Food Markets (209,000), Vikings (168,000) and SBS World News (110,000). 7TWO’s Lewis topped multichannels at 226,000. Did anyone else last to the end of Mammon which concluded on SBS last Tuesday night? I did but still don’t feel much the wiser as to exactly what it was all about. There did seem to be an excellent storyline buried in there somewhere … pity the whole thing was so darn impenetrable. And that doesn’t include all the people like me who watched the cricket live in HD on Fox Sports. At one stage I switched over to 9 and couldn’t believe how poor the picture quality was compared to HD. The difference in picture quality was noticeable between yesterdays game on nine and Tuesdays game on GEM. Even compared to other SD channels nine doesn’t have good picture quality. Me too. Until Mark Waugh schooled the useless Mark Nicholas on commentary when it was highlighted the game was over. I then turned to something else. With the exception of Warne, the nine commentators included in the world cup coverage were a disgrace compared to the ones Fox Sports provided. Having not watched the appalling coverage on nine for years, i had forgotten how bad they were. I also flicked to nine for a quick laugh at the picture quality and they had tim gilbert waffling on. Wow. The afl footy show should’ve been moved to Wednesday. A 10.20pm start was far too late and left no room for any post game when the cricket was completed. Even though I think nine could’ve made good use of multichannels and scheduled the footy show and cricket at the same time therefore giving people choice that wasn’t going to happen because nine lacks imagination. It was obvious that the afl footy show wasn’t live. So why make ridiculous poorly thought out comments about a close finish of the cricket at the beginning which came across as trying to pretend it was live when it obviously wasn’t. Why couldn’t Nine put the cricket on GEM? I had to wait till after 10:00pm for The NRL Footy Show to come on. I wonder if any of the experts on this site have ever been involved in creating a TV show, Hiding and Wonderland are both Australian dramas, OK I admit that some things could be done better but really at least they are out there trying to make a TV show. It is hard work and it relies on so many factors to get it right. Good script, good direction, good acting, good production values, we can do it right, look at the Doctor Blake for example. Good shows will work with good audiences, not just experts. Hiding was not. I’ve been watching Hiding. When I say watching, I mean the type of watching that is similar to when one slows down to gawp at a car accident. Hiding hits the jackpot of badness. Bad premise, bad writing, bad casting, bad acting, and bad directing. You know you’re scraping the bottom of the barrel when you get beaten by z-grade schlock like Wonderland. Seriously, is this the best we can do? Did any of the people involved watch a proper high-end or network TV show to see how it’s done? Have perservered with Hiding against my better judgement just to see how it all ended up. Shouldn’t have bothered – worst ending ever ! At first thought there must be another ep to tie things up. But nope -that was the finale. No resolution, ridiculously implausible ending leaving us hanging. Soundtrack was the only good thing about Hiding. I was going to come back for the finale, but sounds wiser that I did not. Really sorry to hear that, Angela. Hope you get well soon! I taught myself a while ago not to continue watching unmitigated garbage in the forlorn hope that it would magically improve. If the makers of a TV series are unable to hold my attention in the first 20-30 minutes then either the genre/style is not for me or they are incompetent. Hiding was so poorly written and directed that I actually felt a little embarrassed that I hadn’t turned it off after 15 minutes instead of waiting nearly 30. ABC really needs to stop wasting money on juvenile crap like this and Crownies. Will take a while as there are no really decent telly dramas on at present to ease the pain. Yes SS, I don’t normally waste my time like that – of course it was never going to get any better. I totally agree with you Angela. I wish I hadn’t persevered, especially with such a poor ending. We have to make up our own minds about the conclusion. I am still not sure if Costa or Maree shot Nils?? At least with APTCH there were two endings written so it was tidied up before we knew it’s fate with Foxtel. There is no way this will get a second season. I predicted that it wasn’t going to tie up in the final episode and am surprised the ABC didn’t tie it up in some way. I finally watched Janet King and was impressed that even though we are unsure if it will ever get a second season the show ended with a conclusion. Fingers crossed future ABC dramas will not be so badly written and there is a conclusion of sorts. It became clear at an early stage that Hiding was indeed “ridiculously implausible”. I gave it the benefit of the doubt but finally gave it up after EP2. Based on most of the comment here a very wise choice. Annoyed after watching Glee last night to learn that it is being moved to Friday nights. I don’t understand that. Thursday is becoming such a pointless night of tv for me – I end up switching to DVDs and recordings after The Project. Glee was the one program I was watching live. In it’s final season, I think it deserves better – and I have to say, I think it’s a lot better now than it has been for a while, the final season has been written and planned beautifully. Pretty Women still getting high numbers after so many repeat and against the cricket. Current films cannot even match that. Did you know this week marked 25 years since Pretty Woman’s cinema release in the US (March 23, 1990)? The main cast including Richard Gere and Julia Roberts were recently on NBC Today talking about the movie and the impact on their careers. The anniversary was probably the reason Seven chose to air Pretty Woman against the cricket. You’re a mine of TV/film info. Thanks for your contributions. Two days ago I read a TV Tonight reader claiming the cricket on GEM in HD was amazing so when I said to my husband last night “switch to GEM” to find a doco not cricket truly amazed me. The commercial networks are so quick to show reality shows and the like across 2 or more channels but when Australia plays India in the cricket it is SD? Why did Tuesday night’s cricket have the luxury of HD? That’s right, because TBBT was on 9….I will never understand how they decide what programs goes where? Why couldn’t it be on GEM (as well)? The Tuesday game was on GEM because Australia wasn’t playing in it, it had nothing to do with TBBT.